Pinellas County beaches continue to experience extremely high levels of Karenia brevis algal bloom (“Red Tide”) and the impact on our marine life has been significant. For anyone who has ventured out to our beaches, you quickly notice the strong odor from dead fish and the respiratory irritation caused by the airborne red tide toxins. This is one of the most significant red tide events of the last decade. The Town of Redington Shores is working closely with Pinellas County as well as neighboring beach communities in order to remove dead fish from our beaches and provide timely updates to residents and visitors regarding the status of the red tide. As to the clean-up effort, our first line of defense has been several hundred yards offshore with the use of contractors with shrimp boats. These boats are attempting to capture floating dead fish before they arrive on our beaches. Although several tons of fish have been collected from the boats, there are still thousands of fish that make it to the beach. The county has marshalled additional resources over the last week (tractors, beach rakes, etc) in order to help collect and remove the fish kill that washes up on our beaches. Their efforts, along with those of the Town of Redington Shores maintenance staff, have been able to keep pace with most of the inbound dead marine life. Once the fish have been removed from the beach, the next challenge comes in disposing of the fish. The county has selected several locations to place collection dumpsters for use in holding the fish until they can be removed and either incinerated or placed in a landfill. The location of these dumpsters was selected based upon proximity to beach access points and offered the most efficient path for multiple trips back and forth with heavy equipment. Unfortunately, these collection dumpsters have created an extremely unpleasant odor for residents in surrounding homes. We received several calls about the dumpsters and have been working with Pinellas County on solutions to reduce the smell by adding liners to the dumpsters, cleaning thoroughly with disinfectant spray and scheduling more frequent pickups. As noted in my last update, we’ve had several residents contact town hall to ask how they can help. For small amount of fish, you can remove them, place them in a trash bag (or double bag it), seal it and dispose of it through normal trash pick up. Select an area that is 10 ft by 10 ft (100 sq feet). Record the closest street addressSend the address and the photo to Pinellas County by e-mail to watershed@pinellascounty.org. 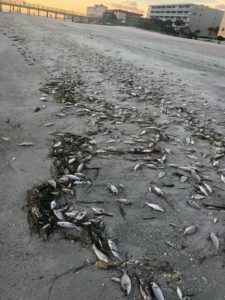 You can also use the county’s SeeClickFix website to report any significant fish kill at https://en.seeclickfix.com/pinellas_county. For those who wish to phone in a report of a significant fish kill, you can contact the Pinellas County Environmental Management team at 727-464-4425. There are a few additional online resources that you can use to learn more about the red tide in our area. For further information about the health risks of the about the Karenia brevis algal bloom, the Florida Department of Health has provided a helpful summary at http://www.floridahealth.gov/environmental-health/aquatic-toxins/red-tide.html. For updates on the status of red tide at each beach in Pinellas County, including odor and respiratory irritation levels, please visit https://www.visitstpeteclearwater.com/current-beach-conditions. And finally, I wanted to thank our town maintenance department team for their tireless efforts to deal with the impacts of the red tide on our beaches. We will continue to make the cleanup efforts our top priority each day until the red tide passes. I appreciate your patience and understanding as we deal with this critical issue. It will “take a village” to work through this event and I remain convinced that we have the best village out there.